The newly refurbished classrooms at Lansdown Park Academy Rush Hill are officially open. 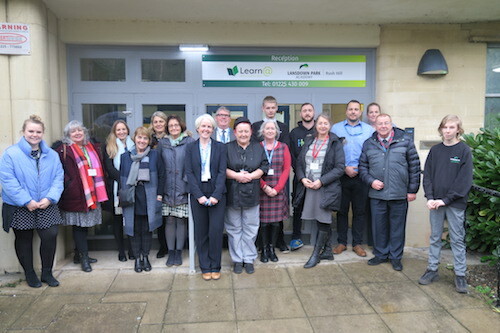 In a refurbished wing of the former Bath Community College, students and teachers were joined by Bath & North East Somerset councillors and partner organisations for a celebratory tea and tour of their classrooms, dining hall and to see the excellent artwork on display. The new school is run by Learn@ Multi Academy Trust, which manages four specialist schools in and around Bristol. At Rush Hill the trust aims to improve the life chances of young people from the Bath area who have been excluded from their secondary school, or are at risk of exclusion. Lansdown Park Academy Rush Hill has places for up to 20 students, from Years 7 to 11 and is working with established partner organisations such as Empire Fighting Chance, Off the Record, Bath Community Farm and Rocksteady to provide a broad and balanced curriculum and offer progression to further education. The school employs specialist teachers and support staff with experience in working with young people with social, emotional or mental health needs. Executive Principal for Rush Hill Lansdown Park Academy Aileen Morrison said: "Young people in Bath finally have the sort of quality facilities they deserve should they find that they are not coping well in their secondary school. “Our Rush Hill pupils were the stars of the open afternoon; welcoming visitors, serving teas and coffees and explaining eloquently their views on their education and their hopes and ambitions for the future. They clearly stepped up to the role of school ambassador and proved again that, even if things haven't always gone well in the past, they are capable of succeeding given the right opportunities. Rhianna, aged 12, has enjoyed the small scale of Rush Hill and is now visiting her new mainstream secondary school with teachers to prepare her move back.